In its Evidence-Based Clinical Practice Guideline: Comprehensive Pediatric Eye and Vision Examination, the American Optometric Association (AOA) reports that the prevalence of strabismus in the general population is somewhere between 2.5% and 4.6%. That’s 8 to 15 million people.As part of the AOA’s efforts to combat what it describes as “an epidemic of undiagnosed eye and vision problems,” the Evidence-Based Clinical Practice Guideline provides both valuable research information, such as prevalence rates, and recommendations for parents and healthcare professionals. The AOA describes strabismus as “a condition in which both eyes do not look at the same place at the same time.” It occurs when one or both eyes turn in, out, up or down some or all of the time. In a normally functioning visual system, the two eyes work as a team. 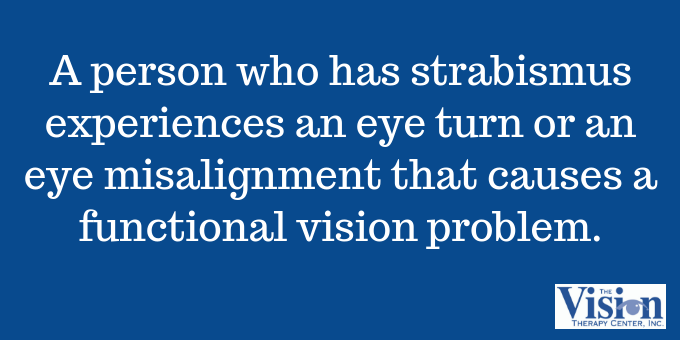 A person who has strabismus experiences an eye turn or an eye misalignment that causes a functional vision problem. Strabismus most impacts eye teaming, one of the three visual skill areas that make up functional vision. Because the eyes are pointing at different places, the brain has difficulty combining the images it sees into a single, 3D image. It’s crucial for healthcare professionals who conduct eye tests to be familiar with prevalence rates of strabismus in comparison with their internal rates of diagnoses. If they find a significant discrepancy between their rates and those of the Guideline, they may want to re-evaluate their examination methods. 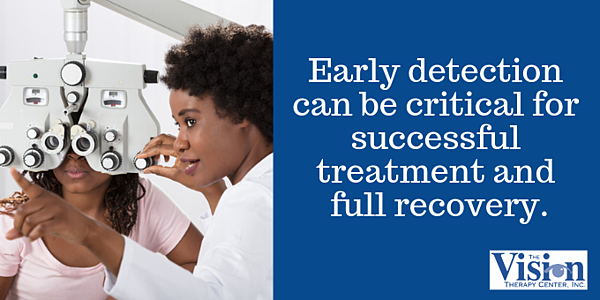 Early detection for strabismus and numerous other eye-related conditions can be critical for successful treatment and full recovery. Besides the obvious appearance of an eye turn, strabismic patients tend to be less symptomatic than patients who have non-strabismic functional vision problems. The reason is that they often turn off (suppress) the information from the eye that is turning, thus avoiding double vision and the symptoms that go along with it. When symptoms are detected, perhaps the most common and well-recognized is impaired depth perception, which can result in poor orientation, clumsiness and poorer performance in sports. Other symptoms may include: eye strain and/or pain, headaches, blurry and/or double vision, eye and/or general fatigue. Eye turns are fairly common and normal in newborns as they learn the visual skill of eye teaming. But if it persists beyond three months of age, the child should be evaluated by a developmental optometrist. One of the reasons it’s important for children to be seen for a Functional Eye Exam from the first year of life onward is because some cases of strabismus may not always be outwardly obvious. In some cases, the eye turn is so small that it is not observable outside of a careful examination. In these cases, children can go for years before anyone notices there is a problem. Identifying and treating the condition early can prevent further functional eye problems such as amblyopia and preserve healthy binocular vision. 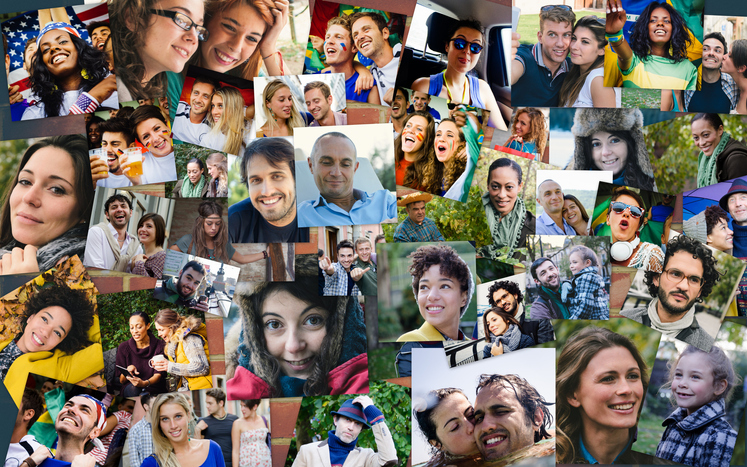 Binocular vision occurs when both eyes see similarly, and the brain can easily combine the images produced by each eye into a single, 3D image. The first step in treating strabismus is to ensure the patient has the best glasses prescription. Our doctors use specialized testing to confirm that the patient’s prescription minimizes visual stress and maximizes visual function. The next step is to determine whether there are changes that can be made in the patient’s environment and behavior to improve their visual function. This is referred to as visual stress reduction or visual hygiene. 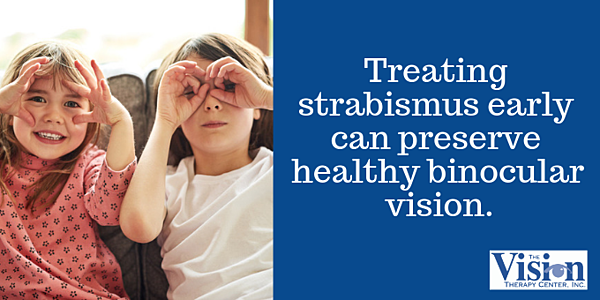 Depending on the patient’s goals, vision therapy may be recommended to treat the strabismus. 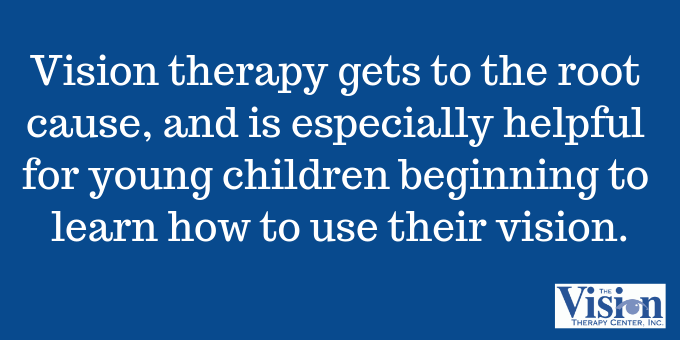 Vision therapy can be especially helpful for young children as they are still just beginning to learn how to use their vision. The reason vision therapy is so important in strabismus treatment is that it gets to the root cause by enabling the person to learn how to use the two eyes together as a team. If surgery has been recommended, a Functional Vision Examination should be done to determine if vision therapy is also a treatment option. In some cases, vision therapy alone may be the best treatment and in others, a combination of therapy and surgery may be the best approach. In every case, it is best to start with vision therapy, as it is a non-invasive treatment.